The MC7 Extra Strength Bore Cleaner from Shooter’s Choice is a convenient aerosol version of our top seller! 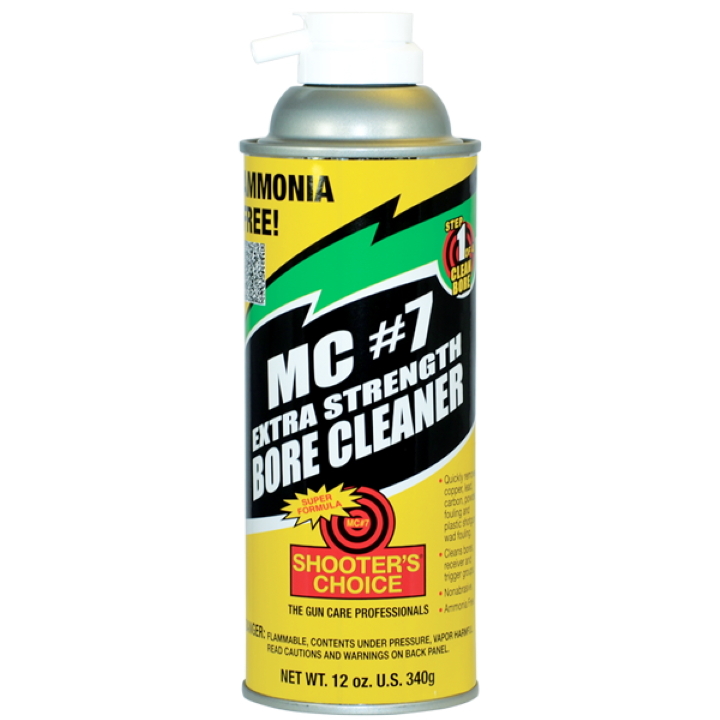 It has been formulated with an enhanced combination of cleaners to work faster and better than the original version of MC #7 - and it’s ammonia free! Bore Cleaning: Before using, shake well then saturate 2 patches with MC #7 Extra Strength Bore Cleaner. Individually push through bore back and forth to remove loose fouling. Using Extension Tube: Spray cleaner into bore using short blasts. For first application allow 5 minutes for cleaner to work. Wet a Phosphorus Bronze Brush with MC #7 Extra Strength Bore Cleaner: Brush the bore 8-10 times. (Flush contaminated brush with Shooter’s Choice Quick Scrub III Cleaner/Degreaser after each brushing.) Dry patch and repeat above steps until a clean patch is produced. Receiver and Trigger Assembly. Spray cleaner directly to areas to be cleaned. Brush using a nylon bristle brush. Flush assembly clean with Shooter’s Choice Quick Scrub III. Lubrication: After degreasing with Quick Scrub III, wipe off any residual cleaner. Apply Shooter’s Choice FP-10 Lubricant Elite® (areas with tight tolerance) and/or Shooter’s Choice All Weather High-Tech Grease (areas with loose tolerance) to all moving parts and wear surfaces. Rust and Corrosion Protection: After lubricating, it is highly recommended to use Shooter’s Choice Rust Prevent. Lightly spray (over top of lubricated areas) the complete receiver, trigger assembly and all interior and exterior metal surfaces. NOTE: Within 5-10 minutes Rust Prevent will dry to a fine greasy film. Long Term Storage: After completing Step 6 run a saturated patch with Rust Prevent down the bore, then spray generously the Rust Prevent once again on all metal surfaces.